*Top Grain 1.1 to 1.2mm drum dyed cowhide for maximum abrasion resistance. *Fully removable 5-piece CE certified armor for elbows, shoulders and back. *2 inside utility pockets: one zippered and one snap pocket. *Liner has third pocket for media and cell phone etc. *Additional right forearm pocket is zippered. *Neoprene padded mandarin collar is adjustable via two front snaps. 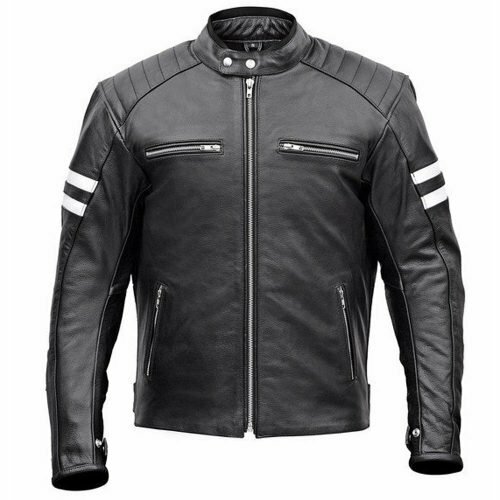 *1.5” storm flap at main front zipper. *All Original YKK zippers throughout. *Padded shoulders. 8” pant integration zipper. 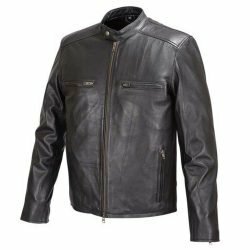 *We provide Limited Lifetime Leather warranty. Our Lifetime Guarantee is a warranty against defects in Leather and workmanship. 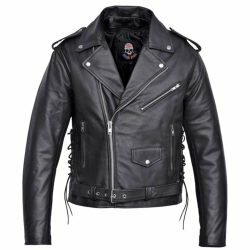 *Our leather, as with all natural materials, will occasionally have unique characteristics such as: small scars, creases and variations in the color and are not considered defects. This Leather Motorcycle Jacket is a timeless classic from WICKED STOCK. 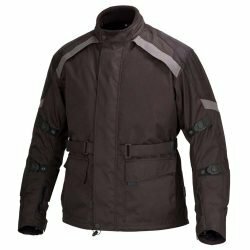 Full Grain 1.1 to 1.2 mm thick cowhide with a full zip out quilted liner makes this an all-season jacket. 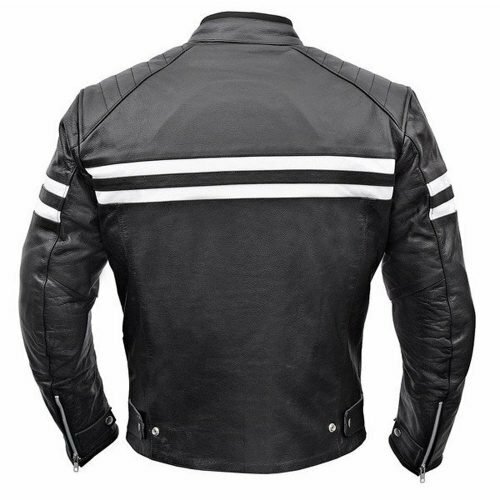 This Jacket Comes in brown and black colors with classic white stripes. We provide Lifetime Leather Warranty on this Jacket. PLEASE MAKE SURE YOU MEASURE YOURSELF UP AND READ THE SIZING CHART BEFORE YOU ORDER. 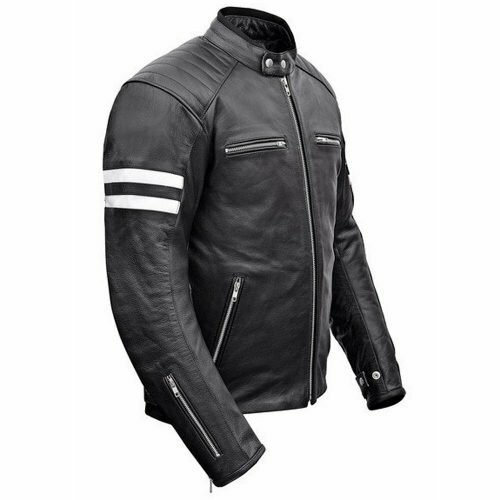 This Leather Motorcycle Jacket is made from Full Grain 1.1 to 1.2-mm thick cowhide for maximum abrasion resistance. 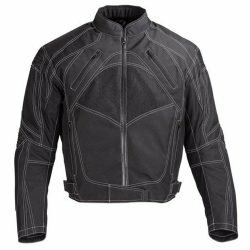 This Leather Motorcycle Jacket comes pre-installed with five pieces of CE Rated Armor; Two elbows, two shoulders and a back protector are all CE rated and conform to EN 1621-1 standard. All these five pieces are in Velcro locked pockets and can be easily removed. 2 inside utility pockets: one zippered and one snap pocket. 4 outside pockets: Two chest level pockets and two waist level zippered pockets. Liner has third pocket for media and cell phone etc. Additional right forearm pocket is zippered. 1.5” storm flap at main front zipper. 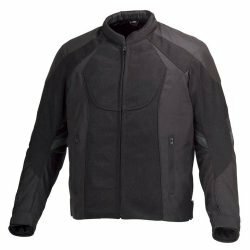 This Lather Motorcycle Jacket has an 8″ pants integration zipper on the inside. All Original YKK zippers throughout. We provide Limited Lifetime Leather warranty. Our Lifetime Guarantee is a warranty against defects in Leather. Our leather, as with all natural materials, will occasionally have unique characteristics such as: small scars, creases and variations in the color and are not considered defects. Check out our similar jackets here. Excelent quality. I buyed size L and it fit perfect.